When it comes to glass tile in Denver, many of those installations are going to wind up as the backsplash to a stove. Glass tiles, being reasonably impervious to all of the insults that splattered cooking can throw at it, are one of the best choices available to install as a visually striking backsplash. However, the beauty of glass tiles may not hold up if the end client cleans them improperly, especially if there is exposed grout in the installation. Rather than possibly fielding a complaint that the glass backsplash was a poor choice because it has optically dulled, become scratched, or even has begun to fail, take just a few minutes to give your end user a few handy glass tile cleaning pointers. Diluted vinegar is a weak acid that will cut grease, loosen dried food splatters, and not harm the tile or grout. A 1:1 ratio of distilled white vinegar and tap water in a spray bottle is usually all that is needed to begin getting any mess off of the backsplash. Just add in a quick reminder to rinse away the solution with plain water to ensure the vinegar scent doesn’t linger after the job is done. Not all kitchen messes are created equally, some demand stronger cleaning measures be taken. For particularly stubborn grease or splatters, the first step would be to try undiluted vinegar. Allow this spray to soak the trouble area for at least ten minutes before trying to wipe it up. Failing this, it is time to resort to a soft bristled nylon brush–never a wire one. Remind your client that with exposed grout, even when it is sealed, scrubbing harder is not cleaning smarter. If micro particles of the grout are busted loose and deposited upon the glass tiles, the material and sealant can leave grimy and filmy residues of their own that become particularly stubborn when dried. If vinegar and a brush aren’t tackling a troublesome mess, an alternate cleaning agent is called for. Take some hot tap water and add a few drops of a dish soap to it in the spray bottle. This solution should be sufficient to loosen up even encrusted messes left behind by cooking. 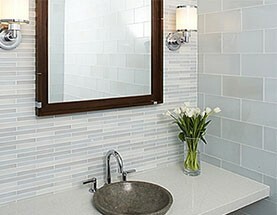 For more information about the largest selection of glass tiles in Denver, contact us.